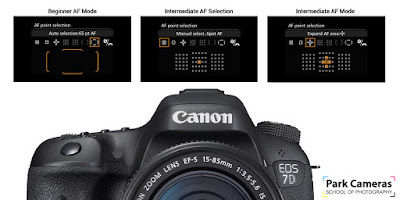 Learn how to use the Canon 7D Mark II with Park Cameras! At the end of last year Canon launched the 7D Mark II, the eagerly awaited replacement to the highly thought of Canon EOS 7D. It is fair to say the Mark 2 version is considerably more sophisticated than its predecessor; with its stand-out feature being a focus system that is class leading in terms of performance and veracity outclassing even the flagship Canon EOS-1D X.
control with a plethora of variable options in the menu system - allowing you to modify well over 100 different settings. especially out of the box and without proper set-up. This camera has been particularly popular with wildlife, sports and bird photographers, all attracted by the improvements to the focusing, frame rate and ISO with the added benefit of the crop factor proving fit for purpose. straight to the 7D Mark II, or are attempting sport or wildlife photography for the first time. 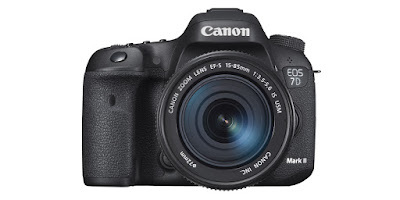 from the camera, at our School of Photography we offer a comprehensive guide on how to get to grips with the Canon EOS 7D Mark II - in fact, we are bold enough to say it is the best in the entire country! 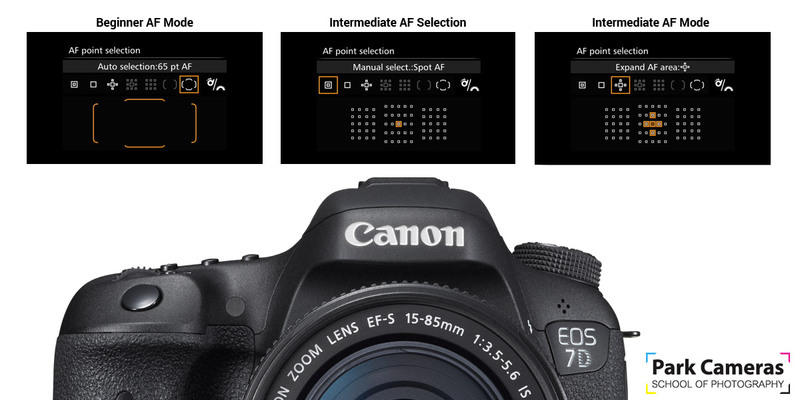 The image below highlights some of the complex, yet powerful, autofocus modes available in your 7D Mark II. Part of this course is not only to show you how to best use the autofocus system, but where best certain settings are used. We can say this with confidence as the course content and multimedia course material ensure that 7D owners can make the most of their new camera, and leave with a whole host of new knowledge, as well as equipped with course notes to refer back to so as not to forget any of the day's discussions! Part of the multimedia content you will get as part of your course are helpful videos guiding you through the 'how-to' aspect of the menus. Below is a teaser of what you can expect if you sign up! If this is of interest to you, please take a look at our School of Photography Camera Courses page to pick a course and date that suits you best. Resolution – RAW & Jpeg. Benefits of RAW over Jpeg & software compatibility & recommendations. Highlight Alert – Why the use of this feature can help reduce the risk of over exposure. My Menu calibration – Calibration of the My Menu for up to five commonly used functions. Histograms & Exposure Compensation, how these can be used to ensure correct exposure in camera. If you own a Canon EOS 7D Mark II please bring this along with a fully charged battery and a storage card. Blog written by Anthony Sinfield, trainer at Park Cameras.